Mz Menneh took a well needed step, that none of our artists have taken, by collaborating with the legendary Jones Dopoe. 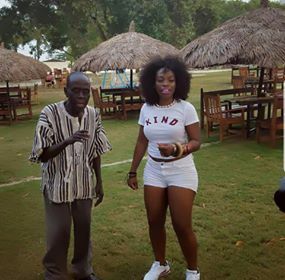 On the "Sweet Sweet Cassava Leaf" remix, Mz Menneh and the Legendary Jones Dopoe took the first step to bridging the generational gap within the Liberian entertainment industry. Jones Dopoe is a famous Liberian artist from the 70's, known for his hit song "Sweet Sweet Cassava Leaf". The Legend has returned to the music scene, recently releasing the music video to his popular song. Mz Menneh didn't hesitate to jump on the remix, which should be dropping very soon. Check out the original song below.